LOOSE AND LEAFY in DORSET: WHAT'S EVERYTHING DOING? Clearly, I can't answer that properly! But I can note a few things - and I have to scurry between the house and the bank (the grassy variety) to keep up. For what's happening is happening fast. 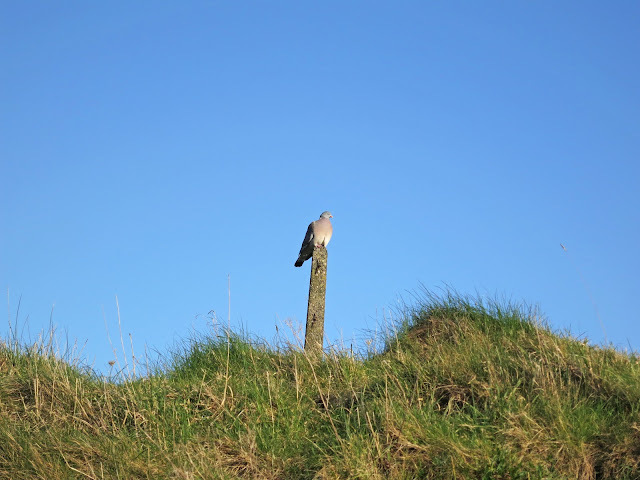 Not that this pigeon sitting on a wonky post with its back to the sea is doing much at present. 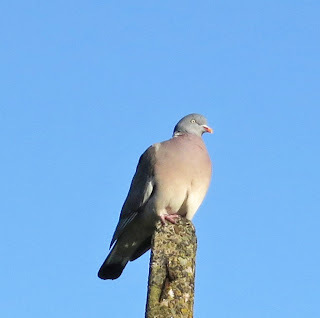 Unlike urban pigeons, and despite being great eaters, wood pigeons never seem to be in a rush. It is, of course, an eagle in disguise. 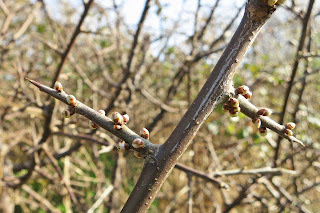 What is the blackthorn doing? It's sprouting flower buds along its thorns. This, it seems to me, is an odd place for them. I don't mean there's anything unusual about what this small tree is doing. It's just that I think it's a surprising arrangement - flowers on thorns instead of beside them. In February, on my other blog (Message in a Milk Bottle) a couple of people mentioned that they are unfamiliar with gorse. 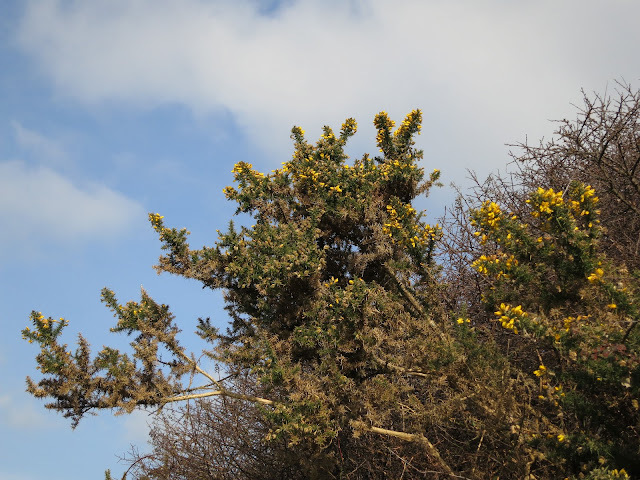 And the question came up whether gorse is always in flower. I can't answer definitively but I'd be surprised if there were any times in the year where some gorse isn't flowering somewhere. In the winter one notices it because its splashes of bright yellow stand out from the gloom. 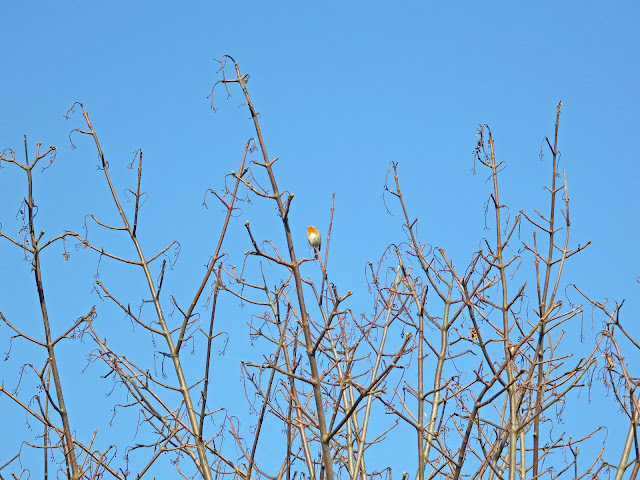 In the last couple of weeks, though, more and more branches have been spurting colour. In the summer, there will be great banks of it round here. I'll give it a post of its own. What is the hawthorn doing? 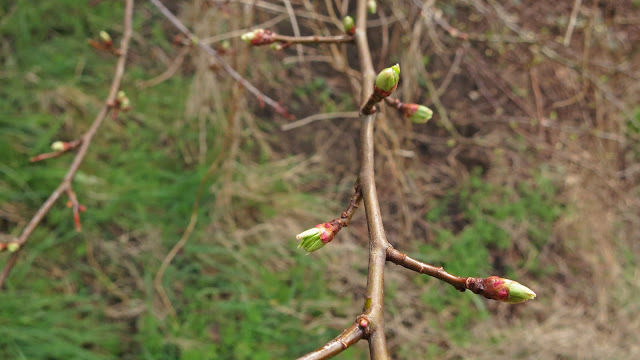 Its leaf buds are opening. When they are new, hawthorn leaves are delightful; a delicate fresh green. Later, they darken and the trees become a bit blobbish. I'm not a bird person. If I can't see who's singing, I don't necessarily know who it is. I can't tell an invisible dunnock from a lark. I guess by the landscape. Bushes - dunnocks. Flat, open land - larks. But, over and over, through the years, I've heard a wonderful song and looked around to see who . . . and it's a robin. And Robins are not shy. They sit somewhere prominent and let rip! I wasn't the only one who stopped for the performance. Perhaps we should have clapped during this pause? Real bird-watchers are quiet people. Those of us who don't know one feather from another stand and chat. The funniest gathering of strangers is when field fares fill a bush and start yelling at each other. You can hardly see them but the bush almost vibrates with noise. One waits for it to explode. Passers-by pause and gaze at it in astonishment. And laugh. 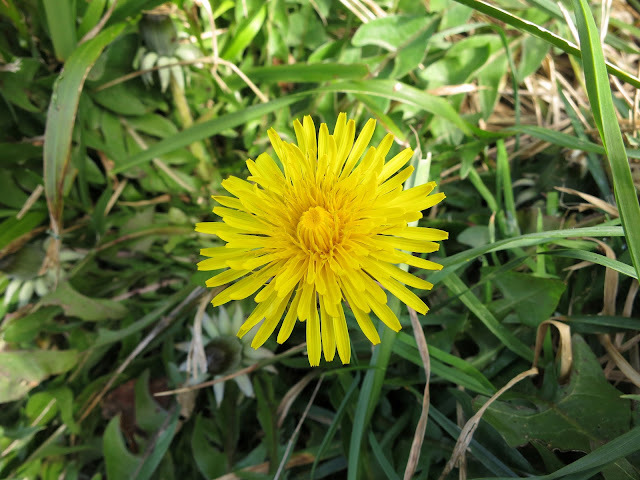 And, just beginning, here and there, the big gold coins of dandelion flowers. Thank you for the wonderful visit. I agree you don't often see blooms right on the thorns. seems a bit early for dandelions - they don't seem to appear here until after the daffodills have gone. Hi, Gerald. There are several. Indeed, I think, most years, there are some all the way through the winter. I found daisies in grass today too. They did surprise me! Hello Country Mouse. I don't remember the fruits being on thorns - but then I don't drink gin so I don't collect sloes! Thanks for the birthday wishes Lucy. As often as it happens ( every year I guess) and as much the same as it is each time, I never tire of the coming of spring! It is my favorite time of year! I love the anticipation of it all! I especially like the blackthorn - I only tend to see them when they are in flower or fruit, so never noticed this "look" before. I'm happy to put up with it. 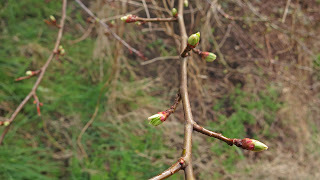 In fact I can't wait for it ;) roll on unfurling of new leaves! 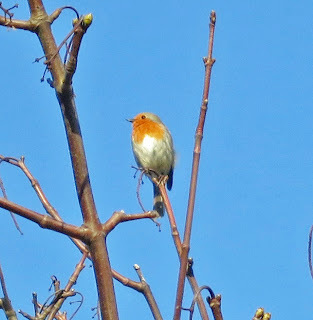 The song of Robins are one the best bird songs me thinks! 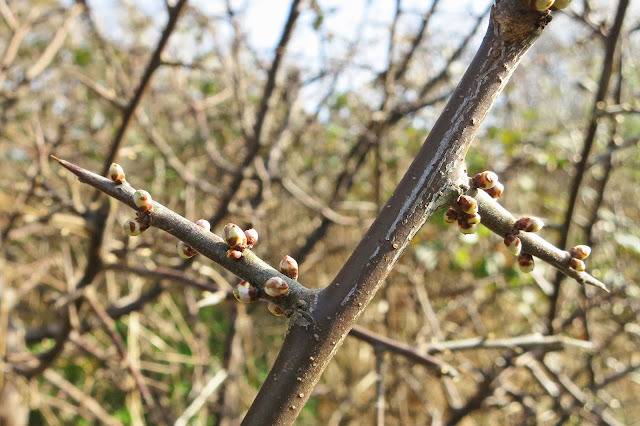 What wonderful photos, our neighbours garden is full of black thorn which is just coming out. I will have to check where they are flowering from. 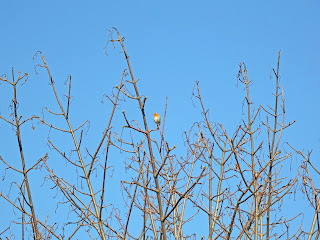 My local Robins have been very vocal recently - along with other members of the Dawn Chorus. Getting up early in the morning ceases to be a pain at this time of year and becomes a pleasure because of this. Our Blackthorns are in bloom already, it always excites me. I saw daisies too and daffodils and primroses. So pretty.